WACO, Texas (Aug. 28, 2018) – Viziv Technologies LLC and Baylor University have announced a new research partnership aimed at commercializing an entirely new means of delivering electrical energy wirelessly over long distances. Over four decades in development, Viziv’s systems use a phenomenon known as a Zenneck surface wave to transmit electromagnetic waves along the interface of earth and air. Viziv’s ultimate goal is to provide the capability to safely, economically and efficiently deliver electrical power virtually anywhere in the world through the use of surface wave technologies. Parallel research efforts at Viziv include the use of surface waves for communication, radio navigation and sensing. Research within the Baylor Research and Innovation Collaborative (BRIC) will inform each of these applications as commercial development continues. The partnership is the first university collaboration for Viziv, an angel-funded startup company with approximately 30 full-time employees spread among its Waxahachie, Milford and BRIC locations. The company foresees doubling its workforce over the next year. 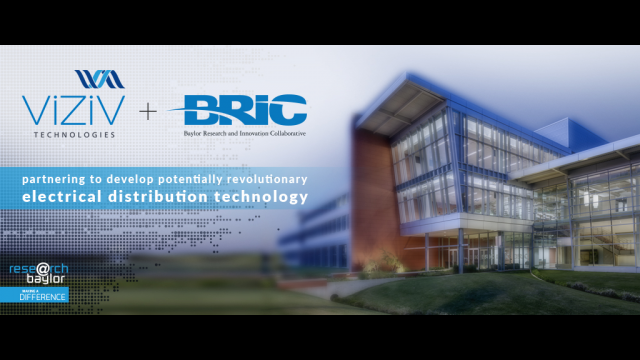 Viziv is leasing 3,055-square-feet in the BRIC, a 330,000-square-foot facility providing companies with access to the intersection of the BRIC’s five foundational pillars: fundamental and applied research, industry collaboration, business acceleration and incubation, workforce development and STEM educational outreach and research. The Viziv technology promises to make energy distribution safer and more reliable. A Zenneck surface wave is unaffected by lightning, geomagnetic disturbances, solar flares or electromagnetic pulses such as those generated by a nuclear blast, so only sending and receiving units will require protection. And unlike the electrical distribution systems that depend on a gridwork that is vulnerable to physical attack, and to cascading failures during peak power usage, wireless electrical delivery is designed to be virtually impervious to these threats. Plus, the field intensities generated are expected to be less than one percent of the current ANSI standards for safety in RF. Viziv’s mission is the commercialization of the Zenneck surface wave in all of its various product applications. From communications to energy to sensing, Viziv’s technological advances are opening doors to a new era in science and engineering. The Office of the Vice Provost for Research (OVPR) assists faculty members from all academic units in identifying, obtaining and managing the funding needed to support their research and scholarship. Internal “seed” funding, matching grant proposal funding, searchable online funding databases, grant writing seminars, proposal support and travel awards to national funding agencies are only a portion of what is provided by the various units comprising the OVPR. Additionally, the Vice Provost for Research oversees the ethical conduct of research and assists researchers in maintaining compliance with applicable policies, laws, and regulations as well as providing support in establishing interdisciplinary / international collaborations and industry partnerships. The OVPR acts as Baylor’s representative in pursuing partnerships and collaborative agreements with entities outside the university. The office negotiates sponsored research agreements with industry on behalf of faculty and pursues research, technology transfer, and the commercialization of technology. The OVPR welcomes the opportunity to discuss collaborative research and scholarship pursuits that can advance the academic mission of Baylor University to achieve R1/T1 status.